We’ve heard time and time again that speaking is the most powerful way to grow your business. There are many benefits to speaking, primarily getting greater exposure to more people at one time and being viewed as a creditable source. Speaking attracts people to you who want to know more about you and your services. Speaking will sky rocket your business. But you? How? When? Where? And on WHAT?!?! We’ve taken all the guess work out of it for you, and made it easier! 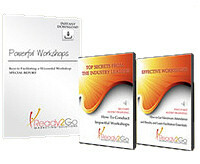 Professionally scripted 30 minute speech on highly relevant topics for your target audience and easily customizable. Speaking guide which includes marketing tips and instructions on where to find places to speak, and suggestions on ways to get the most exposure with your speaking engagement. Use your speech as a standalone product or as part of an integrated marketing strategy. It doesn’t get any easy than this! Everything is done for you, saving you tons of time and effort! And remember, all our products are professionally developed, easy to implement, and GUARANTEED. Sky rocket your business and your speaking career today with a Ready2Go Speech!